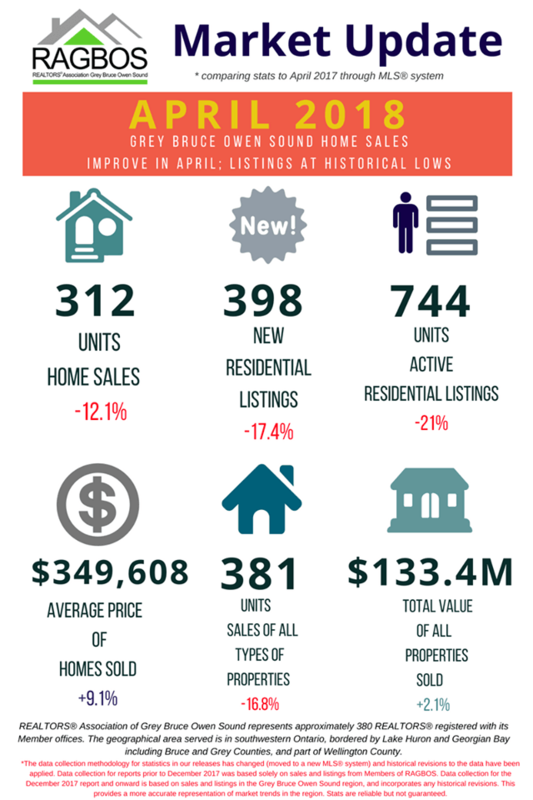 Residential sales activity recorded through the MLS® system for the Grey Bruce Owen Sound and Wellington areas totaled 312 units in April 2018. 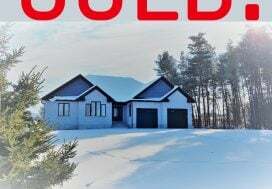 While this was still a decline of 12.1% from the record for the month seen in April 2017, it was effectively tied with 2016 for the second best April sales figure ever in the region. On a year-to-date basis, home sales totalled 788 units over the first four months of the year. This was a decrease of 18.3% from the same period in 2017. The average price of homes sold in April 2018 was a record $349,608, up 9.1% from April 2017. The more comprehensive year-to-date average price was $339,745, rising 10.3% from the first four months of 2017. 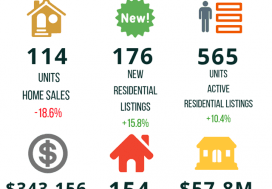 New residential listings in the region numbered 398 units in April 2018. This was a decrease of 17.4% on a year-over-year basis, and marked the lowest level of new supply for April in three decades. Overall supply also stands at record lows. Active residential listings numbered 744 units at the end of April. This was down 21% from the end of April 2017. Months of inventory numbered just 2.4 at the end of April 2018, down from the 2.7 months recorded at the end of April 2017 and well below the long-run average of 7.6 months for this time of year. The number of months of inventory is the number of months it would take to sell current inventories at the current rate of sales activity. The dollar value of all home sales in April 2018 was $109.1 million, down 4.1% from the same month in 2017. Sales of all property types numbered 381 units in April 2018, a decrease of 16.8% from April 2017. The total value of all properties sold was $133.4 million, edging up 2.1% from April 2017. 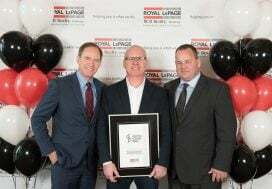 The REALTORS® Association of Grey Bruce Owen Sound represents approximately 380 REALTORS® registered with its member offices. The geographical area served by the Association is in southwestern Ontario, bordered by Lake Huron and Georgian Bay including Bruce and Grey Counties, and part of Wellington County.